Computer Basics Expert Training Materials are designed to develop expert-level computer users in the workplace. Train employees how to utilize task manager, minimize, maximize and restore windows, how to install and uninstall programs, master web browsers and much more! Seeing is Believing This sample manual to teach Computer Basics - Expert is in MS Word format. One of the biggest, if not the biggest, uses of computers today is the internet. With the ability to search the world on countless topics, to sending emails across the country or across the world, it's no secret the internet has changed our lives. 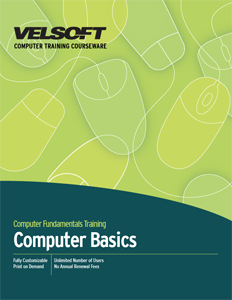 Using the internet is one of the numerous topics in the expert level Computer Basics courseware from Trainingmaterials.com, more specifically web browsers, bookmarks and web searching. In addition to internet and web browsing, the courseware also discusses topics such as application basics and working with windows. This professionally written courseware is perfect for your teaching environment for many reasons. First and foremost it is customizable to meet your needs - edit the courseware to fit your curriculum. Secondly, once you purchase the material it's yours - no annual renewal fees ever. Download a free sample today!